Wednesday, March 20, 2019: The recent die-off of spring-arriving bunker in the Shrewsbury River was most likely a predator-driven event, whereby (most likely) seals were on their tails. 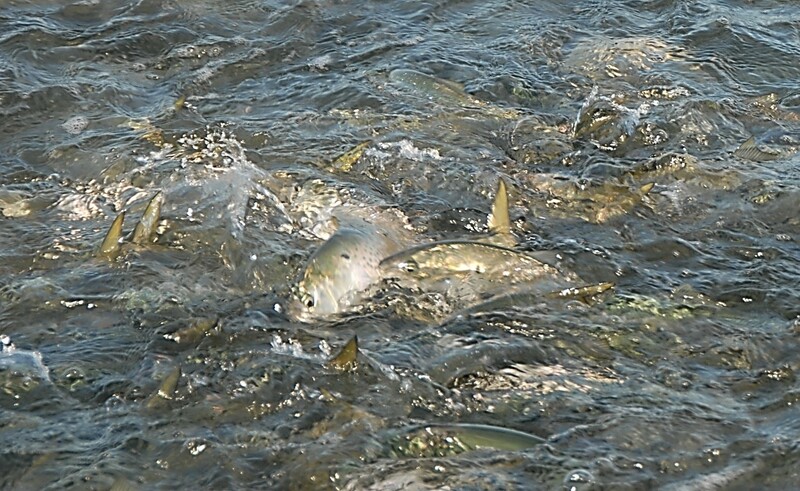 Of course, there’s no excluding bass and way-early bluefish as shaggers of the menhaden, driving them into shallows. Possibly playing into the deadly corralling were very low tides. The bunker must have truly been stacked like sardines since the 45-degree river water was quite high in dissolved oxygen. Again, shallowness played a huge role, possibly the entire overall shallowing of Jersey bays and rivers. Such bunker die-offs have happened year ‘round, going back to times immemorial. It’s a species that quickly gives up the ghost when things go bad -- content with knowing sheer numbers are on their long-term survival side. OK, so maybe they don’t routinely meditate on their role in nature’s survival strategy, but they still seem to readily pass on quickly – and in quiet confidence. 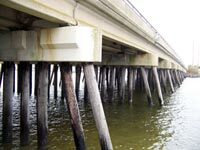 The big bunker are just arriving in Manahawkin Bay, where they gather quite thickly under the Hochstasser Bridge, technically the East Trestle Bridge (closest to LBI). I spent many a night atop that bridge plugging and jigging for stripers, while watching clouds of bunker just lulling about. It was an angling mystery as to why the bass – which could sometimes be seen lurking in the shadows of the bridge – would go after small artificials while all but ignoring the thousands of forage fish. Overnight, the bunker would totally disappear, a sure sign that bluefish had arrived in the bay. In my last blog I mentioned I used to dig bloodworms this time of year and I quickly got two emails asking if I was digging any this year. Likely not. With winter flounder bag limits holding at only two fish of 12 inches or longer (See initial 2019 NJ regs below), the demand isn’t worth the effort. I should note that NJ bloods run small to medium (at best). They are absolutely perfect for blackbacks but just too undersized for stripers, though there was a time I’d takes dozens of them down to Graveling and gob them on. Talk about getting some stares from nearby fishermen, who knew the shop cost for the half dozen I’d use per cast. Speaking of worm digging, it’s mighty informative, once you break out the old worm book to ID the sundry slimers that inhabit the sandy muds we have. 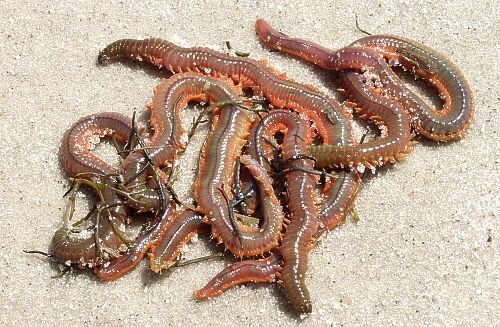 A favorite for me is the fairly common ribbon worms, which would sometimes stretch out well over three feet long, often breaking before I could pull out the entire creature. For years, I simply pulled them out for kicks, until I found out they make a very fine flounder bait and chum. Also, the thick and firmer portion at the head end of the ribbon worm is an excellent schoolie-striper bait. But man are those worms slimy. By the by, there are a couple exclusive LBI areas where sandworms and closely related clamworms can be dug. Those are among the best bass worms going. Sadly, the beach replenishments have ruined – sanded under -- my best oceanside clamworm digs in Beach Haven and Holgate – though I haven’t tried digging them in a few years to see if they survived being plowed over. Over the years I have walked out of many fisheries meetings shaking my head and wondering what just happened. Usually within a week or two I get a better sense of what drove the decision or not. Two weeks ago I attended the joint meeting (ASMFC and MAFMC) and it was among the most frustrating and perplexing I ever attended. I have thought I had seen everything that could happen at summer flounder but I was surprised again. I was always concerned that a better method of computing the recreational catch might result in difficulties in interpreting the new data. I was pleasantly surprised that what I had been suggesting for many years had actually been implemented in the latest benchmark assessment for summer flounder in the recreational statistics. I have been preaching for years that they were underestimating our catch and underestimating the size of the stock. In this report, NMFS stated that they had been underestimating the recreational catch and the size of the stock since we began the management plan. It is important to have a little history to better understand what this means. Before there was a NMFS there was the Bureau of Sportfisheries under the Department of the Interior and the Bureau of Commercial Fisheries under the Department of Commerce. Each had the responsibility of trying to gauge the catch for their sector. The Bureau of Commercial Fisheries had a larger staff and much more money for these tasks since Commerce considered commercial fishing important for the national economy. 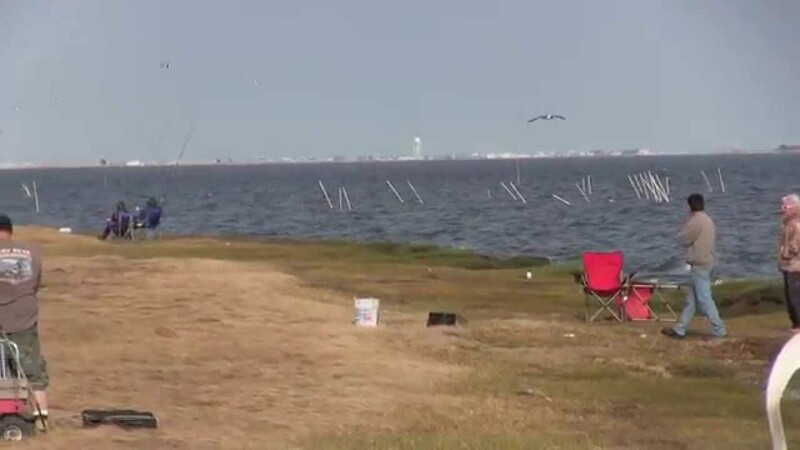 The Bureau of Sportfisheries never had the money necessary to complete their mandated tasks, especially when it came to recording the recreational catch. But they had many excellent scientists and they tried to estimate numbers and the value of the recreational catch. There is a book Al Ristori references from the 70s that states the recreational catch is 70% and commercial was 30%. When the agencies were combined under NMFS, the recreational side became the stepchild and they continued to be understaffed and underfunded. Al Ristori has another document from the late 1970s that states that the recreational catch continued to be the majority. I was not involved during that time but becoming friends with Al in the 80s gave me access to this information. He would attend public hearings, bring out this information only to be completely ignored. NMFS gave little attention since this was not their data even though they gave great credence to the commercial data since it came from the Bureau of the Commercial Fisheries, home to many of NMFS employees. NMFS decided they needed to collect trends in recreational fishing and came up with the Marine Recreational Statistical Survey (MRSS). They spent a pittance on securing the data compared to what they were spending on commercial data. I feel very comfortable in saying it was less than .01% of what was being spent by the states and NMFS collecting commercial data. The intention was never to get accurate data but just to show trends. In the early 90s MRSS data was used to account for catch and participation for the recreational sector though that was never what it was intended to do. The commercial quota was determined based on catch figures gathered through port agents and state landing records. Using MRSS data recreationally and the more accurate commercial data to set up summer flounder quotas, recreational anglers got 40% or the quota and the commercial sector got 60%. Many people questioned the data used saying it ignored the Bureau of Sportfishing data and the historical records on summer flounder. NMFS refused any data they didn’t collect. I was at the table in 1990 when we began to split the catch. Many of the managers and some of the audience members didn’t think these decisions would much impact since there were not real regulations in place on the recreational sector except for striped bass, a size limit on summer flounder in some states and blue fin tuna regulations. Those were the days of no bag limits, no seasons and no quota on the recreational sector. I sounded an alarm in 1994 when we actually put the plans in place but even people in the recreational sector dismissed the idea of a bag limit on summer flounder, scup or black sea bass. Fast recap, we set up a quota split using horrible data for the recreational sector that completely underestimated catch and participation. I am not going to restate the long history that brought us here. The JCAA newspapers are archived from 1995 to the present if you are interested. The question is, where are we in 2019? In 2006 Congress told NMFS to get a system in place to better reflect the recreational data since no one had any confidence in the existing procedures. Of course, no money was allocated to complete this task. The present system is much improved but without sufficient funds there will always be gaps in the information available. So we have just switched from MRSS to MRIP. Summer flounder and striped bass are the first two benchmark stock assessments using this new way of collecting data. The results have been interesting. The new data reinforced much of what many of us have been saying, the recreational catch and participation were seriously underestimated. The summer flounder numbers have changed dramatically. The good news is that NMFS did not say that overfishing was taking place and the stocks were not being overfished. NMFS listened to some of our advice and extrapolated the numbers to increase the stock size to account for the catch. I believe the figures they are using now are certainly more accurate but still do not reflect the actual recreational catch or harvest. What did these figures allow NMFS to do at this meeting? They stated the stock size is much larger than they have been estimating for almost 30 years because of what the data is showing for the recreational catch. NMFS proposed an increase of 49% for the commercial quota for 2019 and implemented it immediately. This required them to trust the data sufficiently to allow for this increase. At the same time they announced that coastwide the recreational fishery for last year was 7 ½% below what we could harvest based on the new data. Based on the old data we have been under more than 5% of our quota for the last 5 years. Understand, I have no problem with them increasing the commercial quota if the stock size allows for that. But I have a real problem telling the recreational community they must stay status quo because they don’t enough confidence in the new data even though we were 7 ½ below. I will explain my concerns in the next paragraph. Mr. Nowalsky and seconded by Mr. Clark made a motion to allow for a 3 ½ percent increase, less than half of the 7 ½% we were under last year. I do not ask for a role call vote so I do not know which other state supported the motion besides NJ, DE and VA. This motion failed because of NMFS objection based on their understanding that the percentage of error could be up to 7%. NMFS seems to think we will go over this year even though we haven’t for last five and did not mention any concern on using the data for the increase of the commercial fishery. I know many of you are confused. Let me try to explain what these figures actually mean. The quota we have been using is like a small 5 dollar pizza. Now we have a larger 20 dollar pizza. We get 40% of the pizza and the commercial sector gets 60%. We have been fishing on the bigger pizza for all these years since NMFS never recognized our total catch. Because they underestimated our total catch, they have been making the commercial community fish on the little pizza’s 60% and that is why I supported the 49% increase. I understand why they didn’t relax the regulations currently in place based on the recreational sector 40% of the quota. But since recreational sector have been under their quota for the last 5 years no matter what data they have been using, it seems only fair that we get the 7% increase in the coastwide quota next year. Increasing our quota would have no impact on the 60% the commercial sector gets. I know New Jersey could do this since we were under by even more than 7%. One or two states did go over but that only resulted in a total 7 ½ underage figure coastwide. I should not have been surprised since the recreational community always gets the short end of the stick. We spent a lot of time at this meeting trying to figure out how we could bring up the commercial catch of some states at the expense of others based on what NMFS thinks the stocks look like now. But we spent no time trying to address the issue of increasing the recreational catch. Now here comes the 2000 pound gorilla! We have been underestimating our catch since NMFS started collecting the numbers. You have already read the history in the beginning of this article. That means when they set the quota at 60/40 commercial/recreational it was based on the flawed data of MRSS without using any of the data from the Bureau of Sportfishing. If we had used the data from the Bureau of Sportfishing and the data the MAFMC had from the early 70s, the split should have been 70/30, recreational/commercial. So every decision made subsequent to that has been based on a flawed original split. This had continued to operate to the detriment of the recreational fishery for years. I can only imagine the discussion at the next meeting when many members of the recreational community have had time to digest all this new information. I look forward to reading the letters you write to the ASMFC, MAFMC, NMFS State and federal legislators, Governors and the Secretary of Commerce. Move to allow for a 3.5% liberalization in summer flounder measures for 2019 relative to preliminary 2018 MRIP harvest estimates, in pounds. Regional proposals will be submitted to ASMFC staff by March 20th, 2019. The technical committee will review proposals, methodologies used, and provide recommendations to the Board during the week of March 25th, 2019. The Board will consider final approval of regional proposals in early April 2019. Motion made by Mr. Nowalsky and seconded by Mr. Clark. Motion fails (4 in favor, 7 opposed). Move to allow regional proposals to establish the 2019 summer flounder recreational measures as specified under Addendum XXXII. Regions may submit proposals that maintain status quo harvest relative to preliminary 2018 MRIP recreational harvest in pounds. Regional proposals will be submitted to ASMFC staff by March 20th, 2019. The technical committee will review proposals, methodologies used, and provide recommendations to the Board during the week of March 25th, 2019. The Board will consider final approval of regional proposals in early April 2019. Motion made by Ms. Meserve and seconded by Mr. Reid Motion carries (8 in favor, 3 opposed). Roll Call: In Favor – MA, RI, CT, NY, MD, PRFC, NC, NMFS; Opposed – NJ, DE, VA.
Table 8: Summer flounder commercial and recreational fishery performance relative to quotas and harvest limits, 2013-2017.